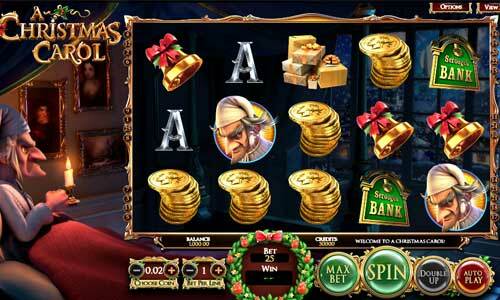 Many online slots players enjoy Christmas slots during the holiday season. These Xmas games normally revolve around Santa, elves, and reindeer, which perfectly fits this time of year. But while it's fun playing any Christmas slot during the Yuletide season, some games stand out above others. Keep reading as we cover our top 5 picks for Xmas slots. We just mentioned that many holiday internet slots revolve around popular themes like Santa and elves. However, Taco Brothers Saving Christmas takes a different approach by featuring a small town in the Mexican desert. This game, which is part of the Taco Brothers series by Elk Studios, sees three brothers thwart Captain Diaz's attempts to control their village. They also hope to win the heart of the lovely Senorita. The background graphics are definitely one of the high points of Taco Brothers Saving Christmas. You'll see detailed buildings, mountains, and snow falling as you play. The bright symbol graphics are also well done. Respins – Getting two Taco Brothers anywhere on the reels awards you a re-spin. Captain Diaz – This evil police captain attempts to put the brothers behind bars. Senorita – Carries keys that can get the brothers out of jail. Wild Escape – The Taco Brothers become running wilds, moving one space across the reels until exiting the screen. 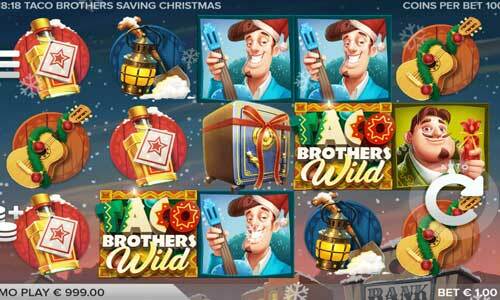 Play Taco Brothers Saving Christmas slot for fun here. Holiday Season combines multiple holidays into one, spanning from Thanksgiving to New Year's Day. 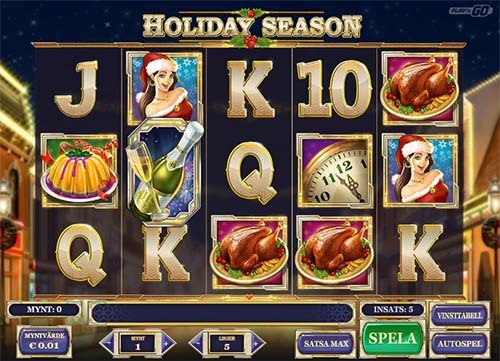 Of course, Christmas is one of the featured seasons in this Play'n GO slot. The atmosphere is our favorite thing about Holiday Season. You'll see a cheery town lining both sides of the reels along with Christmas lights and garland above the street. This game's symbols do a good job of representing different holiday seasons, as you'll see a clock (for New Year's), Thanksgiving turkey, and people dressed for Christmas. The only downside to Holiday Season is that it doesn't have many features. However, you can at least expect to earn scatter prizes, free spins, and a top prize worth up to 500,000 credits. Holiday Season slots won’t blow you away with detailed bonus rounds. But what it does have includes a background and symbols that truly put you in the spirit for Christmas and other holidays. Play Holiday Season slot for fun here. 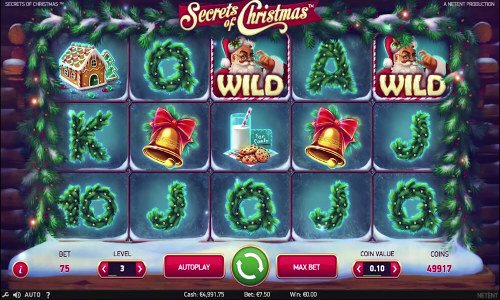 Secrets of Christmas is the perfect embodiment of what a traditional Xmas slot should be. It features classic symbols like presents, bells, stockings, Santa, milk, cookies, and a gingerbread house. The reels stand out because they're framed by snowy windows. The outdoor vantage point allows you to peer into a cozy home while spinning the transparent reels. Overall, NetEnt's Secrets of Christmas is great if you're hoping to enjoy an authentic Christmas game. You can also look forward to a few features, including a two-part bonus round. The first part of the bonus takes you to a living room filled with presents. You choose from these gifts to reveal free spins, expanding wild symbols, and multipliers. The goal is to rack up as many spins and special features as you can. The second part of the bonus involves using your free spins to earn bonus credits. Play Secrets of Christmas slot for fun here. Habanero's Santa's Village doesn’t have the most-original theme. In fact, this looks like a bland Christmas game on the surface. However, Santa's Village does have features that make it stand out. The game begins with you visiting the snow-covered Santa's Village. You then enter a small home, which is filled with Christmas decorations, to start playing the game. Landing a winning payout with Santa triggers a map feature. Santa moves across the map and on towards bonuses. You'll trigger one of two types of free spins once you move Santa all the way across the map. "Sleigh" spins offer between 2-4 presents that are randomly dropped onto the reels. "Santa" spins feature Santa Claus as an expanding wild. Overall, Santa's Village is a poor man's Secrets of Christmas. But the map feature — which is unlike anything we've seen in an Xmas slot — makes this game totally unique. 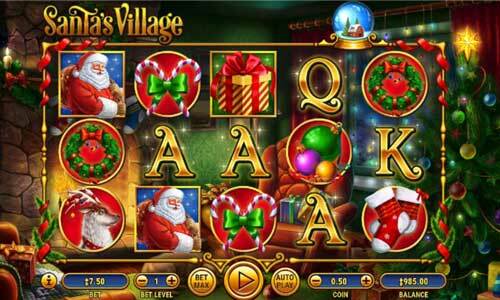 Play Santas Village slot for fun here. The story of Ebenezer Scrooge has been told in many ways. And Betsoft has put their own 'spin' on the story with A Christmas Carol slot. This game arguably features the best graphics among the five slots discussed here. Scrooge and the symbols are really brought to life by the 3D graphics. Speaking of symbols, you'll see three Christmas ghosts, Scrooge, and other holiday icons on the reels. The ghosts are especially important, because they trigger various features. Ghost of Christmas Past – Free spins that guarantee at least one payout. Ghost of Christmas Future – Another set of free spins that guarantee a prize. Ghost of Christmas Present – Any ghost that lands on the reels turns into a locked wild symbol. Play A Christmas Carol slot for fun here. You can find dozens of Christmas-themed slots available at the best online casinos. This gives you tremendous variety when looking for games around the holidays. But if you need some helpful suggestions, then you can't go wrong with any of the choices on this list. We lead off with Taco Brothers Saving Christmas, because it's a one-of-a-kind game. The Mexican village setting and story line are perfect if you're tired of the Santa-and-presents angle. Of course, this isn't to say that traditional Xmas slots are anything to scoff at. Secrets of Christmas, A Christmas Carol, and Santa's Village are all good if you want games that truly bring the Xmas spirit.